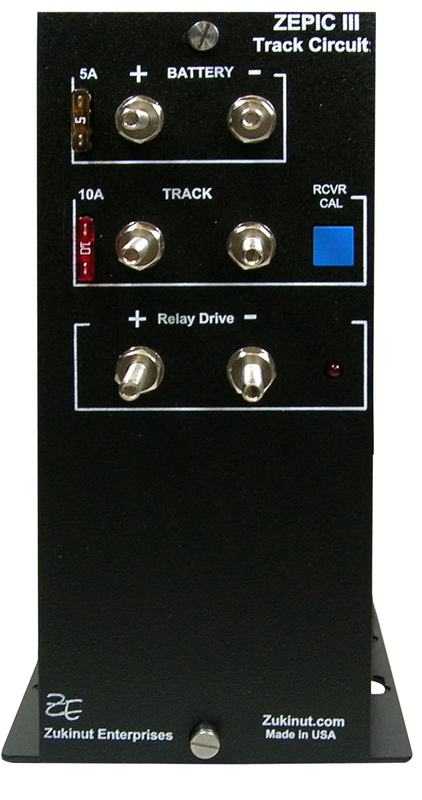 The ZEPICIII is a 2-Wire audio overlay track circuit operating on 9 to 24VDC and is available in the following track drive frequencies: 8.2K, 10K, 11.5K, 13.2K, 15K, 17.5K, 20K. This track circuit provides a sinusoidal output under all track load conditions minimizing possible harmonic interaction with other audio equipment on the track. The unit also provides consistent activation point independent of operating battery. Digital receiver circuitry provides for precise receiver operation. The unit is calibrated by simply dropping a shunt at the activation point and pushing the cal button. Additionally, a non-vital loss of shunt timer is provided to further optimize consistent performance. A front panel LED has been provided to allow a visual indication of the ZEPIC relay drive.